 Computer scientist and composer Holtzman offers a readable and winning introduction to the theoretical and aesthetic principles that will (he claims) inform artistic expression in new media such as virtual reality. Abstract art, contemporary linguistics, and 20th-century classical music are the art forms that, according to Holtzman, link up with these new media. In lucid (if slightly repetitive) chapters, he surveys Saussure's and Chomsky's structuralist approach to language, Kandinsky's evolution toward purely abstract painting, and the efforts of modern composers such as Schoenberg and Boulez to break away from traditional musical systems with 12- tone serial composition techniques. He argues that these disparate intellectual movements share a basis in abstraction: They all concentrate on developing formal ``grammars'' to describe the functioning of their ``languages,'' be they visual or musical or linguistic. Holtzman follows this with an acute sketch of the development of computers and the search for artificial intelligence, emphasizing the basic similarity between computational theory and the formal grammars of linguistics, art, and music. He's at his best discussing various ways in which artists and composers have tried to incorporate the computer into their creative processes and where such ``collaborative'' efforts may lead; unfortunately, his discussion of virtual reality and its possibilities is much shallower, frequently falling back on the tiresome hype of the hacker world. 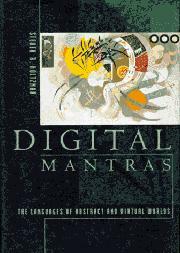 In his later chapters Holtzman argues for what he calls a ``digital aesthetic,'' but his ideas remain vague, as do the quasi-mystical links he tries to draw between structuralist theories and Hindu and Buddhist philosophy. Holtzman preaches the virtues of structuralist aesthetics and computerized art with the fervor--and occasionally the didacticism- -of a prophet; in the end, he provides one of the most insightful considerations of the aesthetics of digital culture to date.